We didn’t develop our products to make money. We invented them to do a job, for us. We wanted high efficiency, fast performance, faultless reliability, high machine availability and a long low-cost working life. So we built it, and it worked. With a long process of experimentation, we devised the MultiDocker – a machine that’s mostly standard, tried-and-tested, ultra-reliable Caterpillar components, enhanced with innovations based on experience. Now we’re proud to offer these to you. For working the docks, scrap yards, pulp log yards, piles of aggregate and ore, dredging, or wherever. We produce one of the worlds’ most versatile and efficient cargo handlers. They are based on standard, reliable well-proven Caterpillar components enhanced with our own industrial and innovative solutions. We have developed a successful plug and play concept. The MultiDocker machine “body” is produced by the Caterpillar factory in Gosselies, Belgium. Caterpillar delivers the “body” to our production site. At this site the machine is modified and adjusted to the customer’s needs. The undercarriage, cabin and front attachment are produced by companies that are specialized in producing just these kinds of parts. When the parts are ready, the suppliers send the parts to the customer’s location. The machine is then brought together and tested by our own specialists. 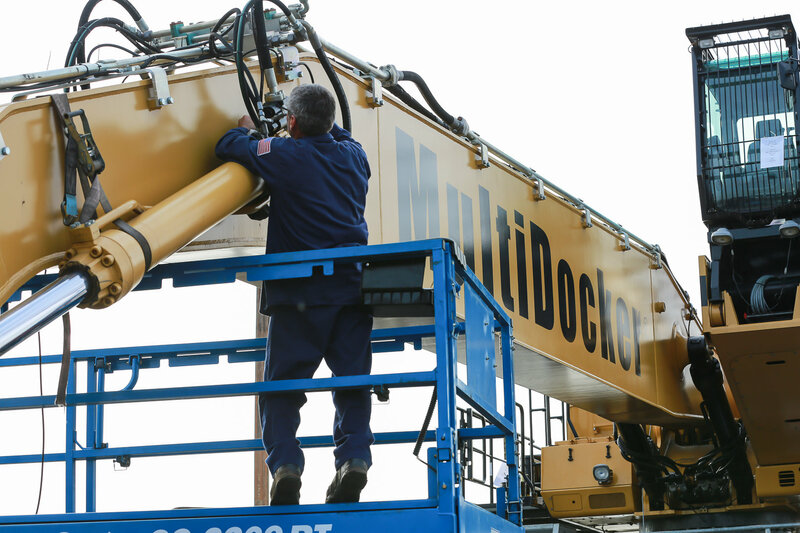 MultiDockers can be custom built to your specifications. 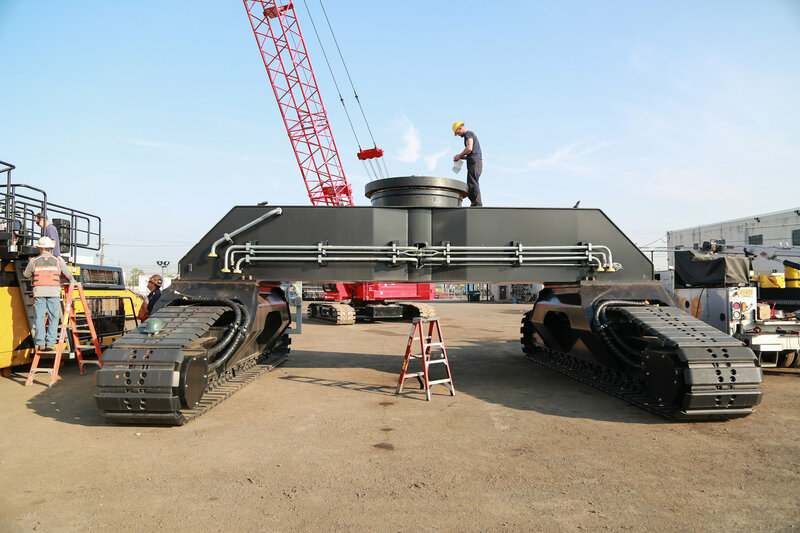 We build many different configurations of hydraulic material and handlers. Our Sales representatives can show you exact machine specifications available to help you choose what best meets your needs! Since 1998, MultiDocker has a fruitful partnership with Caterpillar. Our products are based primarily on Caterpillar machine parts. Not only does this result in top quality machines, it also means the support of Caterpillar’s world class service organisation 24 x 7 x 365. With a premium machine, immediate support, fast spare part deliveries and beneficial service agreements – owning a MultiDocker is safe and profitable. Service is available through Caterpillar’s dealer network, which in 200 countries offers optimized access to spare parts and service. MultiDocker Cargo Handling AB develops and market hydraulic cargo handlers, customized for material handling, ports and industrial use. Together with our external partners we strive to work in ways that support the environment. We shall work to reduce emissions and improve our processes to minimize the usage of energy and natural resources. By improved routines we will reduce the amount of dangerous waste, and prevent emissions to atmosphere and water, that might cause damage to people and environment. We will fulfill the demands in national and international environmental legislation and other regulation and demands. We will constantly improve environmentally adapt activities. Our organization is built of people with entrepreneurial spirit, creativity and the ability to take initiatives. With us you will fuel your own growth by taking responsibility. In order to be happy working with us you must be willing to grow as a person as well as professionally. It is a challenge. But if your commitment and drive show that you have the ability to contribute to our success, you will be noticed and given great opportunities. As an expanding company, we are in a constant state of change and motion. Being a part of the MultiDocker company requires cross-border communications between different teams and countries and, going towards an exciting future together! We are always looking for competent people that can join our team. MultiDocker was founded as a subsidiary to a shipping company*. Their shipping activities were/are concentrated to contractual sea transports. Since its formation, MultiDocker has been heavily involved in the demanding loading and discharging processes of short-sea shipping. By their own experience MultiDocker learned how to make the material handling more efficient in the ports, we started to develop our own material handlers and then used them onboard the barges. The first cargo handler was ready in 1981. It was a reconstructed excavator with a cabin elevator and a reach of 17m. Satisfied with this product the team continued to develop more powerful machines with even better reach and modified undercarriages. The cooperation with Caterpillar started in 1997 and the foundation for the MultiDocker CH was set in the year 2000. This resulted in the most efficient cargo handler ever for ships up to 9,000 deadweight tonnes (dwt). MultiDocker continued to develop and were establishing in several additional countries in Europe. The product portfolio developed over the years with various models, reach and new features. Today, MultiDocker is an established brand in Europe and has set its sights on growing in new markets, such as South America, North America and Asia. We increased our product folio and our products are to be found all over the world. In the coming years, MultiDocker expects solid growth. This growth requires more working capital. With the support of thousand of shareholders, MultiDocker was listed at the NGM Nordic MTF in 2017. The issued capital will mainly be used for market penetration, technical product development and development of the production process. We are experiencing a strong march ahead and are looking forward to present new products and further expansion in 2017. * Österströms was a shipping and logistics company, founded in 1981. The business concept was to be a reliable and qualified partner that delivered effective logistical solutions to the customers. Basically that involved providing an optimised range of vessels, efficient cargo handling methods, terminal management and integrated overland transport along with support from IT systems. The sales total more then a billion kronor, with subsidiaries in seven countries employing 650 people in total. The fleet included some 35 vessels in a mix of owned and time chartered vessels. In 2011 the company was sold to Rederi AB TransAtlantic and MultiDocker were separated from the group.